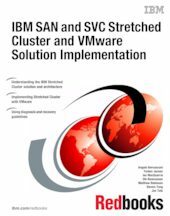 This IBM® Redbooks® publication describes the IBM Storage Area Network and IBM SAN Volume Controller Stretched Cluster solution when combined with VMware. We describe guidelines, settings, and implementation steps necessary to achieve a satisfactory implementation. Business continuity and continuous application availability are among the top requirements for many organizations today. Advances in virtualization, storage, and networking have made enhanced business continuity possible. Information technology solutions can now be designed to manage both planned and unplanned outages, and the flexibility and cost efficiencies available from cloud computing models. IBM has designed a solution that offers significant functionality for maintaining business continuity in a VMware environment. This functionality provides the capability to dynamically move applications across data centers without interruption to those applications.